The latest volume in the Kryon material channeled by Lee Carroll, this 408-page book contains the live channel lings from the years 2003 and 2004. Bringing together the many strands of communications which began in Book 1 – End Times, this is a “must read” for anyone who has chosen the path of Planetary Lightworker, or a life dedicated to World Service. The End Times: New Information for Personal Peace (Kryon Book 1). The Kryon Writings, Inc.. ISBN:0-9636304-2-3 (Paperback). Don't Think Like a Human: Channeled Answers to Basic Questions (Kryon Book 2). The Kryon Writings, Inc. ISBN:0-963604-0-7 (Paperback). Alchemy of the Human Spirit: A Guide to Human Transition into the New Age (Kryon Book 3). The Kryon Writings, Inc. ISBN: 0-9636304-8-2 (Paperback). The Parables of Kryon (Kryon Book 4). Hay House. The Journey Home: The Story of Michael Thomas and the Seven Angels: A Kryon Parable (Book 5). Hay House. ISBN: 1561709875 (Paperback). See our review elsewhere on this site. Partnering With God: Practical Information for the New Millennium (Book 6). 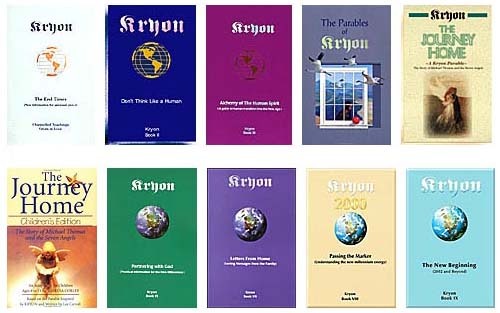 The Kryon Writings, Inc. ISBN:1-888053-10-0 (Paperback). See our review elsewhere on this site. Letters from Home: Loving Messages from the Family (Book 7). The Kryon Writings, Inc. ISBN: 1-888053-12-7 (Paperback). See our review elsewhere on this site. 2000 Passing the Marker (Book 8): Understanding The New Millennium Energy. The Kryon Writings, Inc. ISBN 1-888053-11-9 (Paperback). See our review elsewhere on this site. The New Beginning: 2002 and Beyond (Book 9): The Kryon Writings, Inc.
ISBN: 1-888053-09-7. See our review elsewhere on this site.